Yes you read that correctly and it is official, Summer is going to be my Winter and this is despite summer here on the Gold Coast having an average temperature of 24.1 C - 75.4 F! 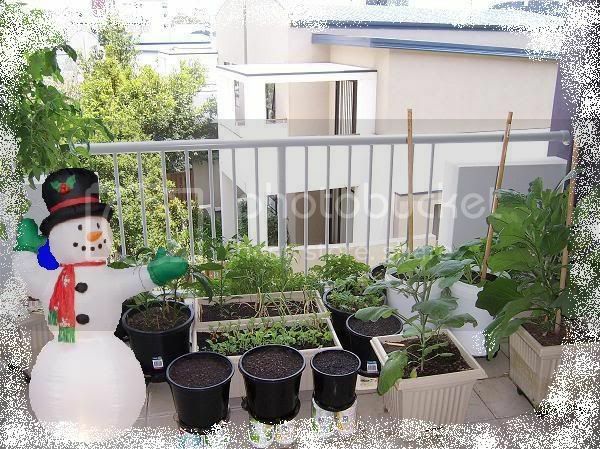 We moved into this apartment last year in March and we had plenty of sun back then, but now I have quickly seen my small plot go from getting around 6 hours of fierce sunlight per day to getting about 3 hours of weak sunlight just before it gives way to the moon. I can only assume that the slight seasonal change in the daily wondering of the sun has been just enough for it to catch the edge of our building and making it MIA for the better part of the dayÃ¢â‚¬Â¦.. Unless I can convince the building manager from the adjacent apartment to erect a massive solar reflector for me thereÃ¢â‚¬â„¢s not much I can do except consolidate what IÃ¢â‚¬â„¢ve got for the next three months and start making plans for the return of the sun in Autumn. Bottom line though, I'm sorry to hear that your chances for sunny garden has diminished. Maybe if you stick to leafy greens? OK, wait, in what is summer here, during the longer daylight hours, the sun rises further NE and sets further NW. Now, as we approach December, the sun is rising more South of East and setting more South of West. So, North/South hemispheres not withstanding, your veranda/balcony must face mostly West or even Northish-west? According to the old watch trick the balcony faces about NNW. IÃ¢â‚¬â„¢m not exactly sure how you managed to work it out that far but IÃ¢â‚¬â„¢m impressed! Prune plum tree summer of winter?